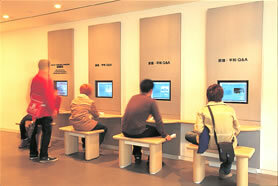 There are two video rooms and a Q&A corner in the museum. Alternately showing “August 9th, Nagasaki” and “Records of the Nagasaki Atomic Bombing”. An animation created by Nagasaki City together with Nagasaki Prefecture as part of the atomic bombing 35th anniversary event in order for the young generation to inherit the experiences of the atomic bomb. Includes English subtitles. Narrated by Misako Watanabe. A movie compilation of footage taken by the United States Strategic Bombing Survey which shows the destruction of the atomic bombing. On July, 1945, the first atomic bomb in the world exploded. This is a documentary which conveys how many nuclear tests have occurred since then, the steps that anti-nuclear/peace movements have taken, and what we can do now.